One thousand Percent. It’s what most top-flight bike builders have to give these days to rise to the top and get noticed. They need the best ideas. The best sketches. The best machining and welding skills. And while we’ve seen the skills that Filippo from Pescara’s Officine Rossopuro possesses, we not sure we ever seen him give one thousand percent. Until now, that is. 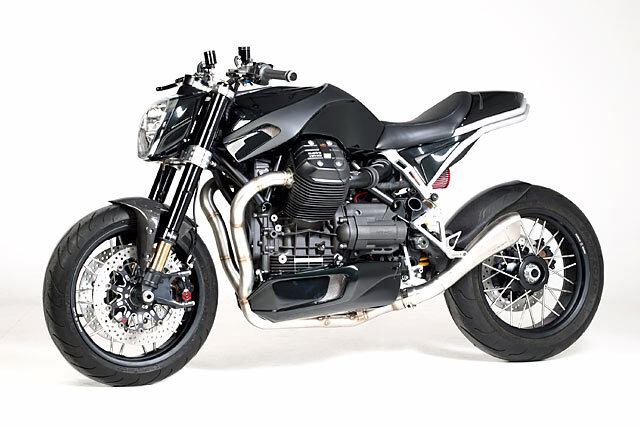 And that’s because tonight’s donor bike wasn’t, as you may have suspected, a Moto Guzzi Griso 8V. No, tonight’s bike started life a little-know ‘Millepercento Alba.’ What the hell is that, you ask? Good question. 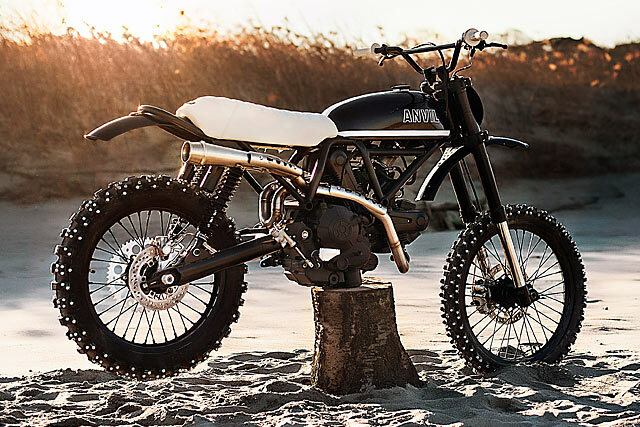 When Ducati announced it was releasing the latest addition to the Scrambler family, the Sixty2, with just 400cc of displacement, many assumed that the Italian giant had finally rolled over and would produce a crappy bike for the masses. The news didn’t get much better when the launch was to be held in Barcelona – complete with hand painting and other assorted arts and crafts. But the first journalists to pin the throttle found out quickly that not only did it pack some punch, but that the Bologna built bike was no sell out. Not at all. 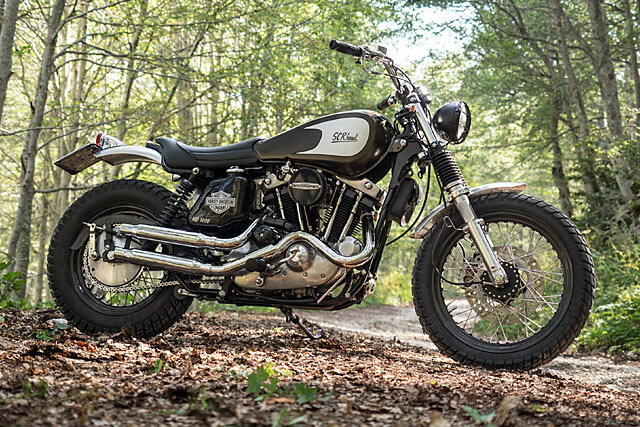 It’s easy to forget that Ducati once built an enormous number of giant killing single cylinder machines and this is not their first rodeo in the small capacity stakes. But to really prove the Sixty2 could cut the mustard, Ducati threw a set of keys to Anvil Motociclette and told them to scramble it. When you’ve plied your trade in the paddock of the Italian Superbike Championship you’d expect your garage would house one of the litre bikes that call the grid home. From the glorious Ducati Panigale to the technology tour de force that is the new Yamaha R1 there is no shortage of choice. But for 25-year-old Dario Denichilo of Milan, Italy, he’s gone in the complete opposite direction. A Moto Guzzi fan he chose to ignore their modern stable of steeds that start at a minimum of 750cc and 200kg in weight and instead chose the little Guzzi that could. 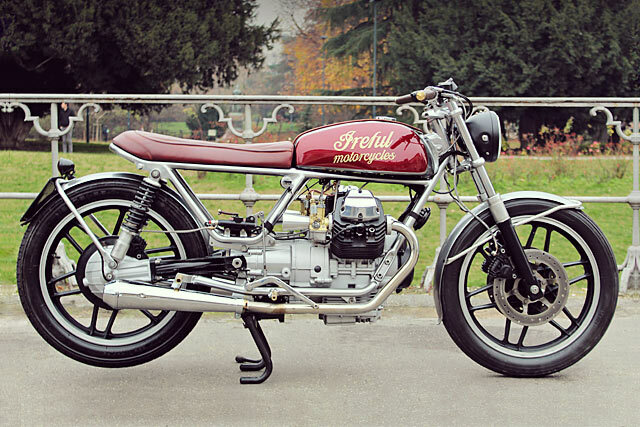 But after an accident on his 1983 Moto Guzzi V35 he decided not only to keep the ugly duckling of the marque but transform it into the custom creation laid out before your eyes as the very first build of his new venture, Ireful Motorcycles. There are roughly 6500 unique languages spoken around the globe today. More than a billion people speak Mandarin, while many others languages have just a thousand native speakers. 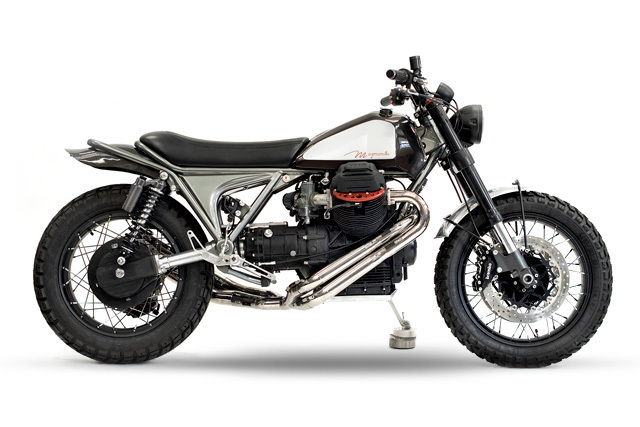 But wherever you go in the world, the language of Moto Guzzi fans is universal. While Ducati might be the king of Italian bike makers these days, Guzzi is arguably more important to the nation’s two wheeled history. Just ask any Guzzi fan and whatever the language they speak, their hand gestures will leave you in no doubt. The V configured engine, the unique engineering and the mechanical beauty of indestructibility sings a sweet song to many an admirer. 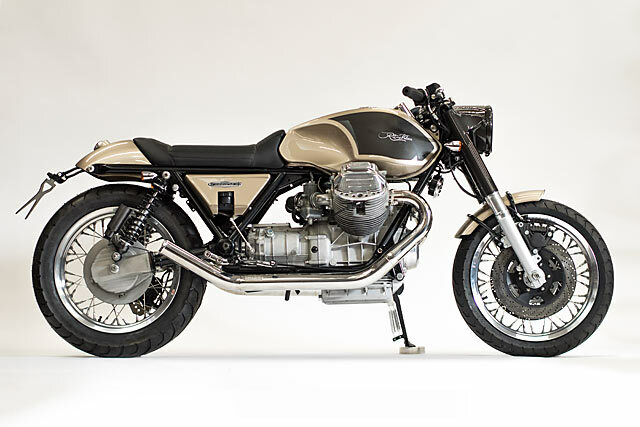 But for all those who love Guzzi’s, very few can build a custom from a Lake Como creation like Filippo Barbacane of Officine Rossopuro in Abruzzo. 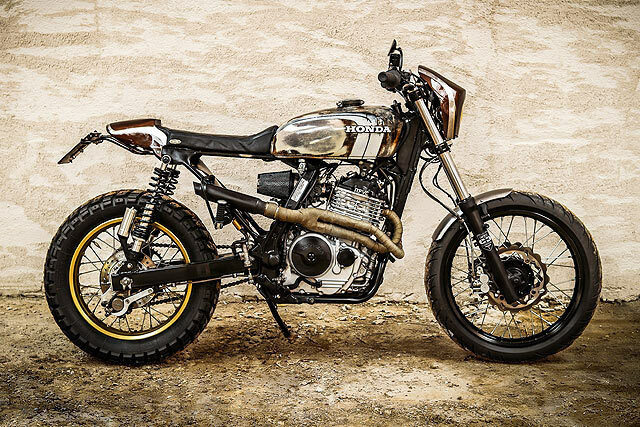 This, his latest masterpiece, is known simply as the Ritmo Veloce 850. For a number of decades the AMA Grand National Championship was dominated by Americans riding American machinery from the big two; Harley Davidson and Indian. That was until the late ’60s when in the space of four years the likes of Gary Nixon and Gene Romero led the charge for British manufacturer Triumph to take out three championships. Unlike the Trackers created today, it was a time of big wide bars, tiny tanks and leather padded seats. The way you paid the racing bills was to be like legend Mike Anderson and work at the local dealership during the week. There were no corporates with big sponsor dollars, no millions to be made and some race tracks still displayed the sign “helmets recommended”. 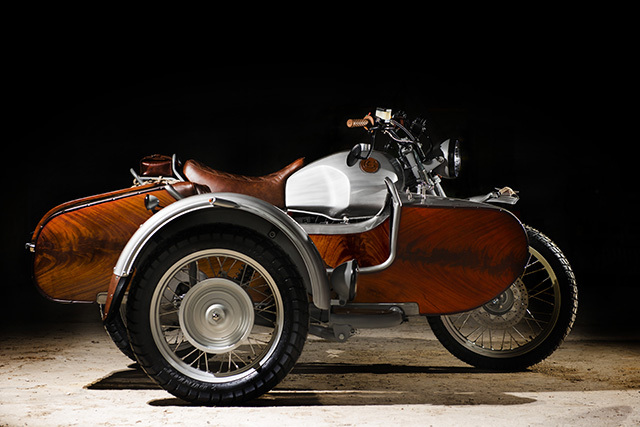 But it was a time of raw competition, big personalities and an authenticity that Italy’s Anvil Motociclette have come to love. 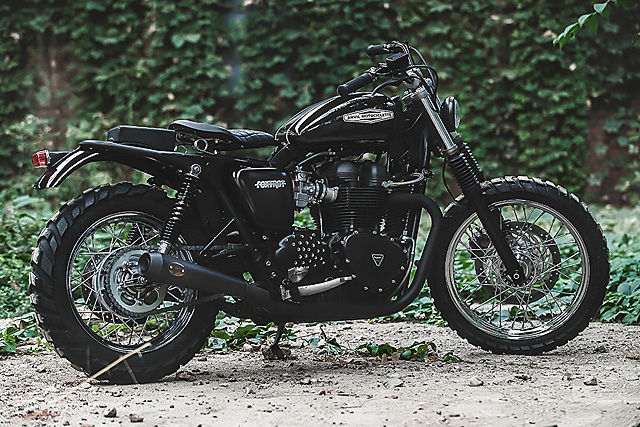 With that spirit in mind they’ve built a bike named Foxtrot, a 2011 Triumph Bonneville 900, that dances rings around the competition.